After blaming softer demand in China and Hong Kong for its worse than expected trans-Pacific performance in 2Q2017, United Airlines is returning to Plan A as it ends service to secondary Chinese city Hangzhou from 14-Oct-2017. United launched three times weekly San Francisco-Hangzhou 787 flights in Jul-2016 when it was unable to secure slots for a second daily San Francisco-Shanghai Pudong service. Hangzhou is part of Shanghai's catchment area, 45 minutes distant by high speed train, and has large digital companies based there, so Hangzhou seemed a worthy alternative to being blocked in Shanghai. Yet after launching Hangzhou, United received slots and launched its second daily San Francisco-Shanghai service in Oct-2016. 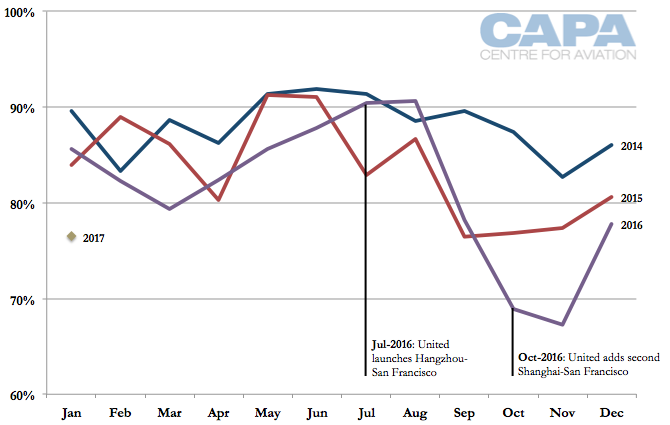 Hangzhou under-performed and incurred load factors below United's average and lower than typical performance for secondary city long-haul routes. United's Shanghai performance has weakened from apparent over-capacity. Ending Hangzhou should alleviate the over-capacity situation. China's secondary long-haul routes attract attention and despite United's Hangzhou exit following BA's Chengdu withdrawal, market fundamentals remain unchanged. What varies is opportunities in primary cities and what different management makes of the secondary city opportunity. After reporting the Pacific as its worst-performing operation in 2Q2017, and the only region with a negative PRASM year-on-year, United Airlines will exit Hangzhou in Oct-2017, 15 months after launching three weekly 787 flights in Jul-2016. Hangzhou has under-performed and United has a better option by directing growth through nearby Shanghai. Further, United's new management wants to re-balance its network by improving domestic and limiting international expansion. United in Jul-2017 during a quarterly earnings call signalled out China as a weakness for its network. United EVP and CCO Andrew Nocella said: "We’re going to be really careful, particularly in Shanghai and Beijing over the next 12 months in terms of our capacity deployment to make sure we can move those markets in the right trajectory for a positive RASM outlook." Discontinuing Hangzhou should alleviate United's presence in Shanghai, nearby to Hangzhou. United previously outlined capacity pressure in secondary markets, which remain a challenge for the airline, citing subsidies that airlines are receiving to open up new routes from Chinese secondary cities. The Hangzhou service was disadvantaged by low aircraft utilisation since the frame – a new 787, not a written-down older type – has a nearly 17 hour layover in Hangzhou (arrival into Hangzhou of 18:15, departure 10:55 the next day). United's Hong Kong services also have a long ground time, impacting utilisation, but the flights are higher-yielding. United Airlines is alone amongst North American operators for flying to secondary Chinese cities. United started with Chengdu in 2014 and then in 2015 added Xi'an (seasonal) and Hangzhou. United had expected to open a new Chinese city every year. United has not announced a new Chinese destination since the Mar-2016 announcement for Hangzhou. The China strategy began under United's previous management: CEO Jeff Smisek and Chief Revenue Officer Jim Compton, as well as VP Network Brian Znotins. By the end of 2016, United's new management was firmly in place, with CEO Oscar Munoz largely leaning on President Scott Kirby for aviation experience. Prior to his CEO appointment, Mr Munoz was on United's board but was not active in day-to-day management. Mr Kirby joined from American Airlines (which has grown in Asia but had to catch-up to United and Delta). Mr Kirby appears to show strength with the domestic market, and intends to hone his skills by improving United's domestic performance. By declaring United will close the margin gap with Delta, some low-hanging fruit like Hangzhou have limited strategic relevance but can make an out-sized contribution to margin improvement. Remarking that competition has grown due to subsidies should be an easy argument to present to investors. Hangzhou and Nanjing are two cities relatively nearby Shanghai. Like their neighbour on the eastern seaboard, Hangzhou and Nanjing have high GDP. Hangzhou is notably home to IT companies while Nanjing has prestigious universities. High speed trains can link Hangzhou and Nanjing to Shanghai in about an hour. While Hangzhou and Nanjing are strong cities, longhaul connectivity can be provided via Shanghai. This is especially for Hangzhou, which can be reached from Shanghai in as little as 45 minutes. In the seven months from United's launch of Hangzhou through Jan-2017 (latest data available), United's Hangzhou service averaged only a 61% load factor, according to US DOT data. Hangzhou's performance was significantly below United's average mainland China load factor of 81% for the same period. Hangzhou also performed below United's two other secondary Chinese destination: Xi'an is seasonal and had a 73% load factor. Chengdu is served year-round and from Jul-2016 through Jan-2017 had an 86% load factor (this is above United's average for China). Load factors do not necessarily correspond to financial performance. For example, Chengdu may have a higher than average load factor because of higher group sales, which traditionally boost load factor. However, in the case of Hangzhou's 61% load factor, such low performance cannot equate to financial strength. Hangzhou launched relatively strongly with 71% and 77% load factors in its first months of service, Jul-2016 and Aug-2016. United announced the service only in Mar-2016, so had a limited window of forward sales. The strong start could indicate aggressive launch fares during the high-volume summer travelling season. 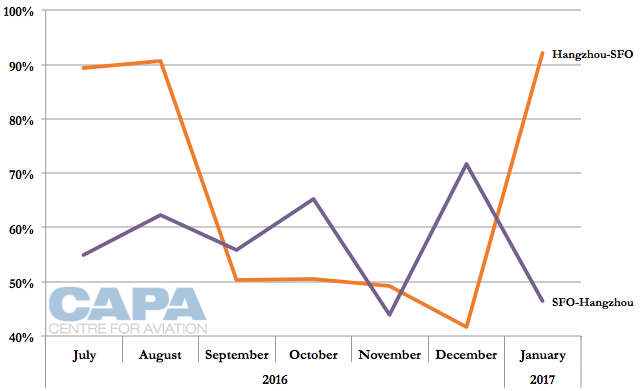 After Aug-2016, United's Hangzhou load factors significantly dipped, including to 47% in Nov-2016. United's average Nov-2016 mainland China load factor was 72% (Chengdu: 78%), again illustrating the difference between Hangzhou and the rest of United's network. United's Hangzhou load factor (61% for Jul-2016 through Jan-2017) also under-performed compared to secondary China-US services offered by all airlines (69% load factor). Once Sichuan launched trans-Pacific service from Hangzhou, United's load factor partially rebounded – although yield information is unknown. This makes it difficult to draw a correlation between Sichuan Airlines adding trans-Pacific capacity and a resulting negative impact on United. Overall however on the Pacific, United's PRASM was, as noted previously, significantly down in the most recent quarter. Further, while Sichuan and United were flying from Hangzhou to two US west coast cities relatively close together, the services were very different. Sichuan Airlines was flying a Chengdu-Hangzhou-Los Angeles routing, so some passengers on Hangzhou-Los Angeles were originating in Chengdu or behind points. Sichuan was selling Los Angeles as a terminating point whereas for United, San Francisco was a hub to the rest of the Americas. The two also have different points of sale and corporate/premium awareness. Direct competition between Sichuan and United may consequently have been very limited. More relevant might be one-stop competition from Hangzhou to North America or passengers using surface transport to access wider – and quickly growing – options at Shanghai. For Hangzhou passengers who were driven by price and not the destination, China Eastern started offering non-stop Sydney services in Nov-2016. Hangzhou also has non-stop flights to Madrid (Beijing Capital Airlines) and Amsterdam (KLM). Caution needs to be exercised reading too much into load factors, but United's Hangzhou service has sharply varying performance for the limited period of data available. Looking at the San Francisco-Hangzhou route load factors by direction, the service launched with strong Hangzhou-SFO load factors, 89% in Jul-2016 and 91% in Aug-2016, suggesting United captured outbound China demand during the summer. This segment is bigger and potentially easier to sell by working through agents (albeit with a net yield penalty) but with the benefit that the Chinese market often books close to departure. Outbound Hangzhou load factors significantly weakened to 50% in Sep-2016 and reached a low point of 42% in Dec-2016. Load factors surged to 92% in Jan-2017 (a 50 point gain in one month) as China began to enter the popular Chinese New Year travelling season. Outbound San Francisco showed less varied, but also not strong, performance. 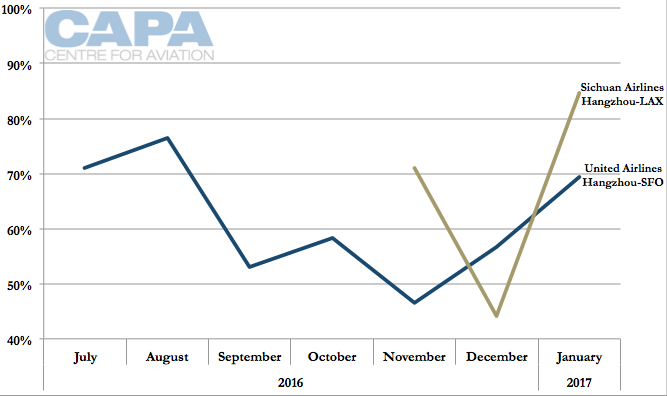 Load factors varied between 55-65% from Jul-2016 to Oct-2016, dropped to 44% in Nov-2016 (when corporate travel often dries up in advance of the US Thanksgiving holiday) and then reached their highest – 72% – in Dec-2016, possibly indicating United was gaining traction (at unknown yield) of Hangzhou awareness to Chinese living in the US and wanting to return home during the US holiday. That returning US traffic, combined with outbound China in advance of Chinese New Year, could have created the strong 92% performance for the Hangzhou-San Francisco direction in Jan-2017. Conversely, the load factor for San Francisco-Hangzhou in Jan-2017 was weak at 46%, possibly a result of little outbound US traffic (holidays over, corporates often in low travelling period) while outbound Chinese passengers would not have returned from Chinese New Year holidays until Feb-2017. United announced Hangzhou service in Mar-2016 with service from Jul-2016 – a relatively quick launch for a US airline and for a long-haul flight, especially one to an entirely new market. United was being partially opportunistic, wanting to launch Hangzhou in time for the peak summer travelling season. Hangzhou became more interesting for United as the airline suffered repeated delays obtaining slots at Shanghai Pudong for a second daily San Francisco service. Shanghai Pudong was growing rapidly due to an additional runway, but slots were apparently being allocated with other interests in mind – and United is a rival to local airline China Eastern. As Hangzhou was in Shanghai's catchment area and Hangzhou had its own local traffic, leisure and corporate, the tactic was to try to have Hangzhou fulfill some of the growth of the second Shanghai service. Additionally, existing Hangzhou traffic on the Shanghai flight could instead fly on the Hangzhou flight, thereby freeing up space on the Shanghai flight. Although Hangzhou had a lower profile than Shanghai, incentives and subsidies would help defray costs. United was not alone in this approach. KLM and Qatar Airways serve Hangzhou in addition to Shanghai - although Ethiopian Airlines ended Hangzhou service with its launch to Shanghai. A week after launching Hangzhou-San Francisco, United was able to file plans for its second daily Shanghai-San Francisco flight. With Hangzhou flying, United could not cancel the service – United would have to wait to see how Hangzhou performed, both on its own and relative to the additional Shanghai flight. But the writing was probably already on the wall for Hangzhou. United Airlines increased Shanghai-San Francisco from one to two daily in Oct-2016. The increase appears to have impacted the route's load factor performance (again, specific yield information is unavailable). 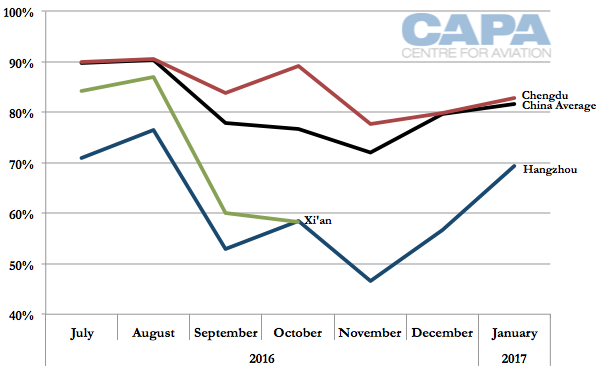 United's Shanghai-San Francisco load factor was weaker through most of early 2016 compared to 2015 and 2014, but 2016 had a stronger summer performance. 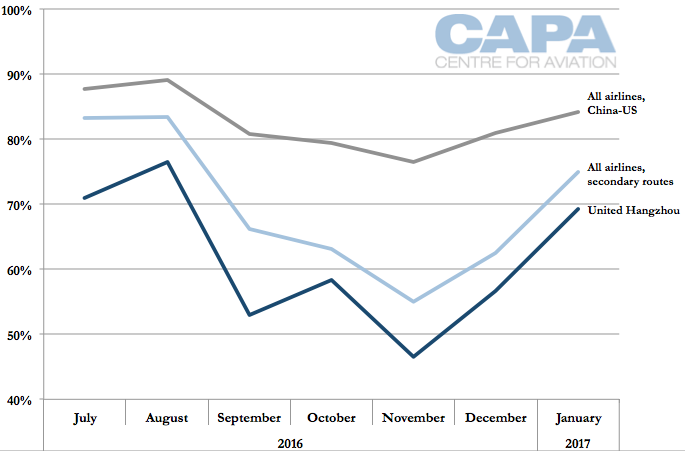 Load factor fell in Sep-2016, as is common, and the Sep-2016 load factor was marginally above Sep-2015. But in Oct-2016 – when United increased Shanghai-San Francisco – the load factor significantly decreased below 2015 levels and remained depressed through Jan-2017 (latest data available). This could indicate weakness following the Shanghai-San Francisco capacity increase. However, load factors fell in late-2015 compared to late-2014, indicating it is increasingly challenging to sell off-peak seasons as capacity is added annually to the US-China market. Both factors are likely a contribution with the conclusion that an additional Shanghai service, as United originally intended, is more important in the short- and long term than a flight to nearby Hangzhou. United can either remove capacity all together from China or redeploy the aircraft to a different area to build a foothold for the long term, but with priorities now at home, it seems United is less bullish about the China market than it used to be. As with British Airways' exit from Chengdu, United's exit from Hangzhou will provoke questions about the viability of China's secondary city longhaul routes. To be certain, these markets are challenging and low yielding. Airlines see the need to build up the market, secure growth (slots and traffic rights) and – not to be overlooked – begin the long process of forming relationships with local officials. Without extremely generous incentives and subsidies, many of the secondary city long haul routes would not be flying. The Chinese city markets are not weakening. They are growing, but the nature of that expansion could differ from expected forecasts. Yet this is often of limited relevance. What matters and can change is first an airline's willingness to stomach weak financials, and second the need for the airline to be in the secondary market. British Airways left Chengdu for a number of reasons, but mostly because it was able to grow in Shanghai, which to BA is of far more relevance than Chengdu. United no longer needs Hangzhou now that it has its second Shanghai-San Francisco flight. It is often thought that airlines are misguided in entering these secondary markets. Yet what is overlooked is the crucial role of subsides - and how generous they are. Also overlooked is the purpose behind the subsidies. Subsidies and route incentives are typically designed to bring passengers into the city, yet Chinese subsidies are typically to bring passengers out of the city, thereby creating very limited local economic impact. The gain that a city makes from an international flight is prestige and accomplishments to the local government. Airlines are very well aware of the dynamics of China's secondary markets. If there is change, it will result from China re-evaluating why it gives subsidies and the amount dispensed.